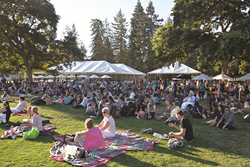 Menlo College announced the return of The Entrepreneurial Summer Concert Series, presented by NASDAQ Private Market. The series, which starts in June, will showcase four nights of live music featuring local bands made up of serial entrepreneurs, VC’s and other people working in the start-up ecosystem. The concerts are free and open to the public and include food trucks, music, networking and fun giveaways. “NASDAQ Private Market is thrilled to be back for a second season, bringing the region’s start-up companies together to share their music and perform for their colleagues,” said Carine Schneider, President, Equity Solutions at NASDAQ Private Market. To see more information about the music line-up and concert dates, please visit: http://www.npmconcertseries.com. In addition to Menlo College and NASDAQ Private Market, sponsors include CDW, Cisco, Dimension Data, Solarflare, Persimmon Marketing, Pacific Yachting and Sailing, Fourth and Heart, Business Rockstars, Clayton Design, and M. Kathleen Kelly. RSVP on the website to automatically be entered to win prizes. Menlo College was established in 1927 in Atherton, California as a small, private, non-profit school that focuses on business education with a strong liberal arts emphasis. Located in the heart of Silicon Valley thirty minutes south of San Francisco, Menlo has been named among the "Best Colleges in the West" by The Princeton Review seven years running and a U.S. News "Best Regional College" for the last five years. http://www.menlo.edu. The NASDAQ Private Market, LLC is the premier equity services provider to private companies. Our end-to-end solution enables private companies to digitize, integrate, and control all of their equity-related functions, including cap table management, shareholder liquidity, investor relations, and capital raising. The information contained herein is provided for informational and educational purposes only. None of the information provided is an offer or solicitation to buy or sell any securities, or to provide any legal, tax, investment or financial advice. The NASDAQ Private Market, LLC is not: (a) a registered exchange under the Securities Exchange Act of 1934; (b) a registered investment adviser under the Investment Advisers Act of 1940; or (c) a financial or tax planner, and does not offer legal advice to any user of the NASDAQ Private Market website. Securities-related services are provided by SMTX, LLC, a registered broker-dealer, which is a member FINRA/SIPC and a wholly-owned subsidiary of The NASDAQ Private Market, LLC. Securities offered through SMTX, LLC are not listed or traded on The NASDAQ Stock Market LLC, nor are the securities subject to the same listing or qualification standards applicable to securities listed or traded on The NASDAQ Stock Market LLC. To learn more, visit http://www.npm.com.